A very important detail to consider before reserving your stateroom is which type of room will work best for your needs. With a little knowledge of how the ship and its cabins are laid out, you can avoid any unpleasant surprises when you first open the door of your assigned stateroom. On Carnival Conquest, all rooms measure seven feet high. The doorway is 22 inches by six feet eight inches high. Standard bathrooms will be four and a half feet by six feet, while the suite's bathrooms are slightly larger at four and a half feet by seven and a half feet, and they include a tub. Standard staterooms will either be 185 square feet with a 17 inch porthole, or 220 square feet with a standard four by three feet window. The Scenic Ocean View rooms are 230 square feet with an eight by seven foot window. Scenic Grand Ocean View rooms have the same size window and are 320 square feet. Ocean View rooms with a standard balcony are either 185 or 195 square feet with a four foot by four foot window. The balcony measures 35 square feet. Ocean View with an Aft-view and Extended Balcony are 185 square feet with a four by four foot window and a 60 square foot balcony. Ocean view rooms with a wraparound balcony have the same measurements as the Aft-view rooms, but their balcony is 75 square feet. Suites will provide more space. The Junior Suite with a standard balcony is 275 square feet with five and a half by four foot window. The balcony is 35 square feet. The Ocean Suites with large balconies are identical in measurements except for the balcony, which is 65 square feet. A Grand Suite with a large balcony will give you a wondrous 345 square feet with five and a half by four foot window. The balcony is spacious at 85 square feet. The largest staterooms by far are the Captain's Suites. Measuring from 500 to 582 square feet, they include five and a half by four foot window, as well as a balcony from 150 square feet to a whopping 258 square feet. On the Conquest, guests will enjoy the Carnival Comfort Bed Sleep System. This custom made in Europe package has custom pillows, duvet and cover, pillow cases, and mattress sets. You can request non-allergenic alternative bedding for those with allergic reactions to down. This alternative bedding comprises a 100 percent polyester blanket and sheets, and it includes pillow cases of 60 percent cotton and 40 percent polyester. All beds except trundles and rollaway beds have the Carnival Comfort Sleep System. Many staterooms have two twin beds that convert into a king sized bed. Twin beds measure 78 inches long by 33 inches wide. Single sofa beds are 75 by 32 inches, and double sofa beds are 81 by 55 inches. All sofa beds have a six and a half inch mattress. Four and a half inch mattresses are used on rollaway and trundle beds. Be aware that a trundle is only 73 by 29 inches and has a weight limit of 250 pounds. Rollaway beds are slightly larger at 75 by 29 inches. Upper berth areas are 78 by 33 inches with a 50 by six inch safety rail, as it is 58 inches from the floor. They also have a 250 pound weight limit. Upper berths, trundles, and rollaway beds are best suited to very small adults and children. The Riviera Deck has cabins directly above it, making the staterooms on this level quieter than those decks with public areas above them. Keep in mind that if your room doesn't have a wonderful view, there are small observation decks that are open to all guests. Staterooms with portholes instead of windows are 1207-1208, 1211-1212, 1216-1217, and 1220-1221. The Main Deck is positioned under the dining rooms and lounge but this should not pose a problem with noise. Most guests are not in their staterooms during meals, avoiding any noise from diners above. Staterooms with portholes instead of windows include 2211-2212, 2216-2217, and 2220-2221. Rooms 2446 and 2449 windows are partially blocked / obstructed due to a gondola where the cleaning machinery is kept. 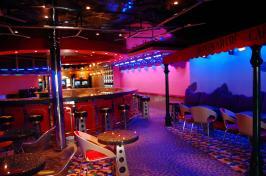 The Upper Deck is above the main nightlife areas onboard so the noise can be loud at times. Avoid rooms 6356 through 6489, as they are the loudest. Staterooms with obstructed views are 6201-6206. Most staterooms have two twin beds that convert into one king sized bed. The exceptions are staterooms 6205 and 6206 which do not convert to king. Empress is quite desirable. This is the deck that contains most of the suites but some staterooms on this level can be expensive. Noise is not a problem in this area. Staterooms with obstructed views are 7201-7206. Windows are tinted, allowing some privacy during the day. Closing the curtains is recommended for nighttime. All staterooms will come with a standard bathtub and shower. Grand Suites have a shower and whirlpool tub combination. These are found in rooms on the Empress Deck, including 7228, 7289, 7294, 7295, 7298, 7299, 7306, 7307, 7312, and 7315. Junior Suites and Ocean Suites with the whirlpool tub and shower are also found on the Empress Deck in rooms 7228, 7230, 7231, 7233, 7238, 7239, 7242, 7243, 7248-7251, 7258, 7259, 7262-7275, 7278, 7279, 7282, 7283, 7314, 7317, 7322, 7325, 7326, 7329, 7330, and 7333. Stateroom 7228 has a roll in shower and whirlpool tub. Half of the Veranda Deck is under another deck, while the other half is under the pool. You may hear noise in the rooms under the pool as lounge chairs are dragged from place to place especially at night when the crew is cleaning. The quietest staterooms on this level are 8201-8291. Lido Deck is closest to the pool, gym, and spa. If swimming is top on your to do list, choose rooms between 9288 and 9294. Staterooms 9196-9199 are Scenic Ocean View staterooms that are 230 square feet with an eight by seven foot window. The Junior Suites 9205 and 9206 are 275 square feet with five and a half by four foot window. The balcony is 35 square feet. These rooms also include a whirlpool tub and shower combination. Captain Suites 9209 and 9203 are equipped with the luxury of two bathrooms. The one in the bedroom has a whirlpool tub and shower, while the bathroom off of the living area only has the shower. 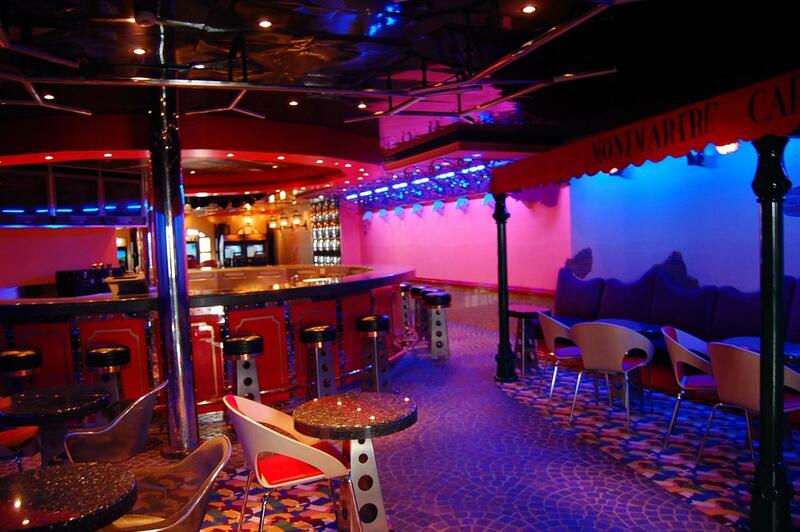 The Spa Deck is ideal if you want your time on the Carnival Conquest to be all about pampering yourself. You'll find your stateroom to be nearby the salon, gym, and Spa Carnival. One will find all staterooms on this deck to be quite comfortable, many larger rooms with balconies.